Luxury pens from Pianki are the epitome of fine pens. Buy the most exclusive handmade fine pens and writing instruments for luxury pen collectors and lovers of fine writing pens with luxury gift pens for any occasion. The art of fine writing demands passionate craftsmanship by world class pen makers. Pianki luxury pen companies are simply the best. 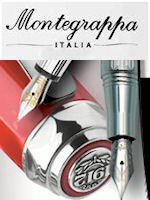 Since 1912 Montegrappa luxury pens embody the Italian flair for the highest levels of creativity. Handmade luxury pens from the world class French house renowned for beauty and innovation. Luxury Swiss pens in 18ct gold, rhodium coated silver, lacquer, and precious materials. Handmade fine writing instruments in gold and silver, enamel, and precious stones. 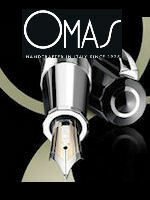 First Jewels, then Pens: Exclusive and expensive fountain pens and writing instruments from Italy. 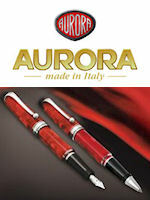 Aurora pens tell a story, an Italian story of modernity and a tradition of fine writing instruments. 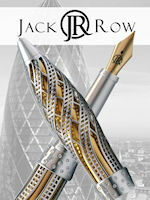 Limited Edition British pens in gold, silver, platinum and set with diamonds and sapphires. British luxury pens with hallmarked solid gold and sterling silver and a 100 year guarantee. 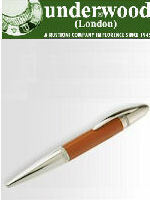 Luxury limited edition pens from Italy's first fountain pen manufacturer. A sleek collection of luxury pens for executives and professionals. A chic and beautiful collection of pens and embossing stamps for lovers who love writing. 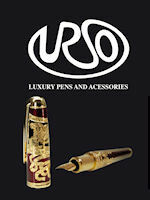 Italian luxury fountain pens and fine writing instruments renowned for innovation, and passion. 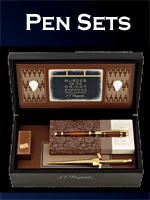 Luxury pens in themed sets for gifting and collectors. Buy Alexander Kalifano Gemstone Pens fashioned with semi-precious gemstones. 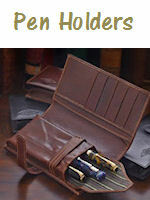 Carry, store, and protect your valuable luxury pens and writing instruments. We offer a growing range of the best luxury pen makers. Buy exclusive limited edition luxury pens from Conway Stewart, Ferrari da Varese, and Caran d'Ache. 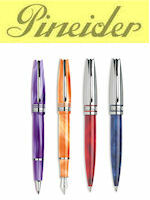 Choose from the fine writing pens from Aurora, Omas, Pineider, Tibaldi, S.T. Dupont, Montegrappa,and Visconti. We offer select luxury Cartier and Mont Blanc Pens. 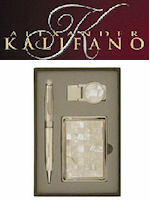 Get Gemstone Globe Executive desk sets and gemstone pens from Alexander Kalifano. Personalized pens are available from many of our luxury fine pen brands and companies. 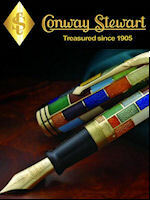 Conway Stewart Pens have always been the pen manufacturer of choice of the most discerning and famous people from around the world. This tradition continues to this day. Her Majesty Queen Elizabeth II and the Duke of Edinburgh; Prime Minister Blair; Russian President Putin; French President Jacques Chirac. Conway Stewart was the official pen chosen by the British Government for the G8 Summit at which Prime Minister Blair presented the model 58 set to each of the G8 world leaders. Conway Stewart is the supplier to No 10 Downing Street, the official residence of the British Prime Minister, as well as, the British Royal Palaces. President Bush and President Clinton both own a Conway Stewart. 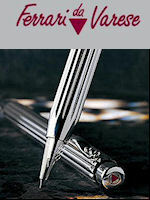 Ferrari da Varese Fine Writing Instruments and Pens are first jewels then pens. They are some of the most exclusive, and coveted fine writing instruments available. They are the writing pens of luxury and romance. Ferrari da Varese solely uses precious materials for the manufacture of their pens. Besides Ferrari's main material, the noble sterling silver, gold, natural horn and woods, glass-enamel and a bit of lacquer are commonly used in the manufacture of their pens. Nicely engraved or hand-crafted, their writing instruments are sometimes crowned with precious natural stones (diamonds, sapphire, turquoise, onyx) or even pearls. 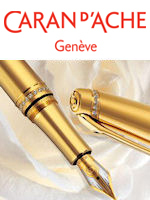 Caran d'Ache fine writing instruments are crafted by a veritable "Maison de Haute Ecriture": With its priceless legacy of expertise, Caran d'Ache is keeping the art of writing alive and well. In the great Swiss manufacturing tradition, it works with passion and rigor to create exceptional products. Caran d'Ache fine writing instruments are recognized the world over for their excellence and daring combination of of technology and aesthetics. They are technical marvels that have a strong emotional appeal. By combining originality in the use of materials with perfection of form they make writing by hand a genuinely refined experience. When you offer a Caran d'Ache luxury pen, writing pen, drawing, or accessory, you are choosing a symbol of prestige and style that affirms your love of beautiful things. Tibaldi luxury writing instruments are a wonder to behold. Working in collaboration with famous brands such as Riva, Bentley, and Giorgio Armani, as well as their own creative team, Tibaldi has demonstrated the passion and ability to create expensive luxury limited edition luxury pens that are highly sought by collectors and lovers of the beautiful. Working especially in silver and gold and other precious materials a Tibaldi pen becomes not just an exquisite fine writing instrument but an precious writing jewel. 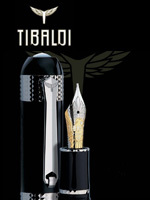 Under its brand, Tibaldi specializes in limited edition pens. Each Tibaldi pen manufactured incorporates the divine proportion in its design. S.T. 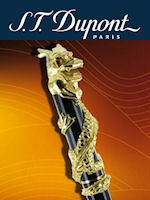 Dupont is famous for the designs of its fine writing instruments. These luxury pens from France are amongst the most sought after writing instruments by collectors and lovers of fine writing. With a storied range of limited editions and well regarded everyday luxury pens, S. T. Dupont is one of the finest luxury pen brands and pen manufacturers available. Alexander Kalifano Pens offers the fabulous collection of exquisite gemstone pens and executive gemstone pen desk sets that enhance the writing endeavor. Gemstone Pens and Gemstone Globe Writing Pen sets are stylish gifts and make excellent romantic gifts, business gifts and corporate gifts. The selection of ink pens and pen sets is broad, each featuring a gemstone globe and, depending on the model, clocks, thermometers, letter openers and more. With the selection of colors one can buy a gift for him or a gift for her, an executive gift, business gift, or corporate gift that is unique as well as beautiful. A gemstone writing pen and world globe make a wonderful gift combination for any occasion. Since 1912, Montegrappa Pen has been a manufacturer luxury pens and fine writing implements in the same historic building located in Bassano del Grappa. The Montegrappa 1912 Pen brand is creator of some of the most luxurious and collectable pens available. Desired by famous personages, celebrities, and collectors, Montegrappa 1912 is the luxury pen company associated with the passion of Italy. Conway Stewart British Luxury Pens, Ferrari da Varese Writing Jewels, Montblanc pens, S. T. Dupont Fine Writing Instruments, Gemstone Pens, and Gemstone Globe Ballpoint Pen sets are great luxury writing pen gift ideas for any occasion: wedding anniversary, Christmas, retirement, executive, or graduation or any gift occasion. A Montblanc pen gift is wonderful for a 21st,30th 25th, 40th, 50th, or 60th birthday or wedding anniversary gift. Luxury writing pens, and fountain pen sets are fabulous gift ideas. Visit Pianki to buy luxury pens for business gifts, corporate gifts, home decor ideas or interior design ideas. Buy the right gift for him or a romantic gift for her; our luxury writing pens, fountain pens, and gemstone pen sets, will fill any writing pen need.